My name is Diana and welcome to the Ultimate Blog Party 2014! This incredible event is hosted by the wonderful ladies at 5MinutesForMom.com and it is the perfect opportunity to discover blogs new and old, and win prizes, too! The UBP is in it's 8th year and I loved it so much when I first participated in it back in 2010 that I joined once again in 2011, 2012 and 2013. To all of my readers, why not take a load off and check out what it's all about. For all of you UBP blog hoppers, thanks for stopping by and please stay a while. You might discover six weird things you didn't know about me or how I met Covergirl P!NK backstage during her Toronto concert. And if you like crafts, feel free to stop by my other blog Diana's Designs where I share my handmade card creations. In the meantime, I hope you'll share a little something about yourself and how you started blogging. Looking forward to partying with you! wow. you met Oprah! lucky!! I was happy to see this post this morning as that is always the question when you sit down to put a piece together and ask yourself what are you doing this for? I can honestly say Diana that you (and I'm sure we spoke of this briefly early on) and a select few of other bloggers are the reason. What most of you don't know is that i developed my passion for blogging while off suffering from depression and anxiety from things both interior and exterior driven. It opened my eyes to a new to me way of expressing myself to an audience that can get to know the real me without putting stereotypes on the color or style of shirt I'm wearing or if I'm wearing the latest style. I blog about the everyday, the way i see it, those that influence it in the good and the bad. Those that know me will see that I'm passionate when reviewing products and put into it as much as possible and love the tech side of things. If it has a plug, takes batteries or powered for an alternate energy source, I either; own it, want it or dream about it. I have of course in my minds eye the most wonderful little family with a beautiful wife and DD7 at this point in time and spend any possible moment that I can with them as nobody can take away memories made. I incorporate my home life into my blogging life as much as possible so people know not only me but my family. Many people have gotten me where I am in this industry such as yourself; Lina Almeida, Tenille Lafontaine, Stacey Martin, Julie Elsdon-Height, Wanda Lynn Young, Cathy Canton...Paula Shuck, Margarita Ibbott the list goes on and on but these few among others had taken time and still do to answer questions for me and help me out as they have been there. I belong to Blogging Communities such as Sharon Vinderline's PTPA (parent tested parent approved) as well as Erica Ehm's YMC (yummy mummy club). O.k. condensing now as I'm writing a post and NOT a novel..lol. My blog is www.answerthetullyphone.com and is an open ended blog. It is not a personal blog per say, although most of it is based upon my opinions, it also has other great information on it as well and your just going to have to drop in, say high and take a gander. Being new in this industry is tough and content will start out slow, however, I'm getting there and i thank you Diana for that and all the other bloggers even though not mentioned will know who they are. Something as simple as a quick tip in Blogger, wordpress or how to run a giveaway goes a long way people. If you take a couple things away from me during a twitter party or pick up from my blog is that i enjoy helping others more than you know, i love to have a laugh and create some fun and I'm as genuine as they come so take a second and pick up the tullyphone! Thanks so much for sharing a 'little' about yourself. I'm so glad you found a way to cope through depression and anxiety by means of blogging. I will definitely be stopping by your blog to hear what's on the other end of the tullyphone. And thanks again for stopping by and for your continual support. Cheers! I'm such a huge Oprah fan!!! I would LOVE to meet her. Thanks for hosting, Susan! 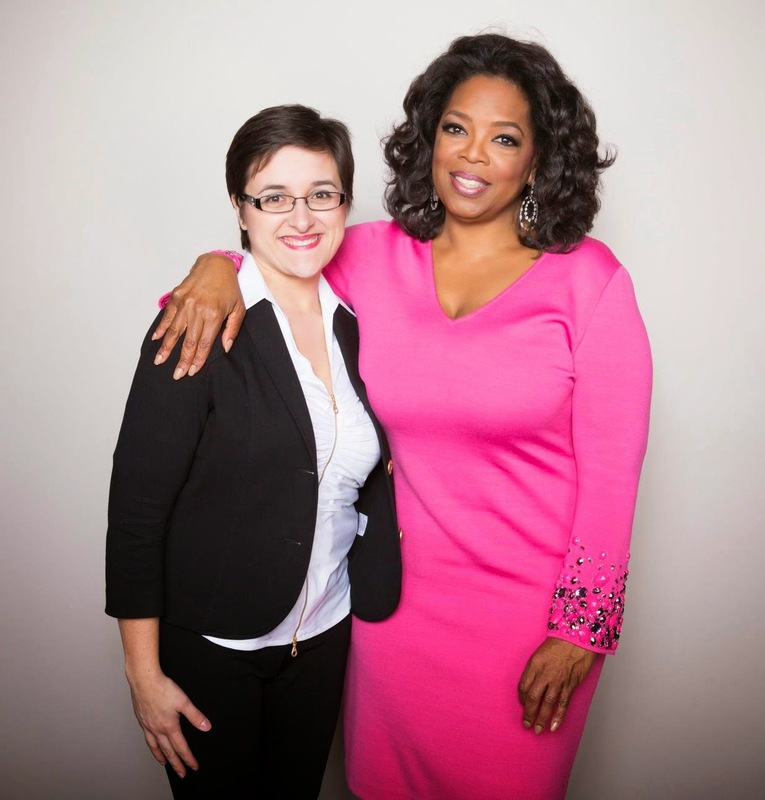 I was a little awestruck when I met Oprah and didn't know quite what to say. Thoroughly enjoyed listening to her speak, though. Hi Kate! Thanks for stopping by. Hope you enjoy the rest of the UBP14! Ha, ha! I hadn't blogged that photo yet so I figured the UBP was a good time to share it. Thanks for stopping by, Clare. Hope you enjoy the party! HOLY COW you met Oprah?! That's crazy awesome! Party on & I'm looking forward to seeing more of your posts! I KNOW! I still can't believe it. Thanks for stopping in, Cathy! Hope you enjoy the rest of the party! Hi, stopping by from #UBP14! Can't wait to follow along! I am so glad you encouraged me to join in on the party! Looking forward to getting to know and "meet" some new bloggers and reconnect with ones I currently love! Hi Diana nice to meet you at #UBP14 . I love Oprah but I got excited when you mentioned you met Pink backstage in Toronto. I'm a huge Pink fan! Stopping by from UBP.. I loved your 6 weird things post.. how do you blow bubbles with your tongue?!?! Hey we both first particiapted in 2010 and funny enough that is how we first "met"
Bonjour! C'est trop cool que vous etes une prof de francais. =) I haven't spoke French in quite awhile unfortunately. But I love bloggers who include anything with the French language!! =)) From the UBP14. I'm over at www.mommyandlove.com. Hope you are enjoying the party... You're last Nutella post is making me want crepes for dinner btw!! YUMM! So when/how did you meet Oprah? I'm stopping by from the UBP14 and must know the details! Oprah, wow! Can't wait to read around and find out more! Nice to "meet" you, Diana! :) I'm catching up on the UBP list, haha... I have 4 kids under 5 and blog at Jornie.com "in my spare time." ;) It's great fun being Mommy, really... Just have to blog and chase kiddos at the same time. Lol. Hopping around to everyone's blogs and social accounts, so I'll be following you soon also! Take care! Hmm... That didn't link right, not sure why it's saying I'm on blogger, haha! This comment should be linked to the right blog :) sorry about that!